A sequel to the arcade racing game, in which the players are driving vehicles in order to create spectacular crashes and gain as many points as possible. Danger Zone 2 features eight cars that can be wrecked on American, British, and Spanish highways. 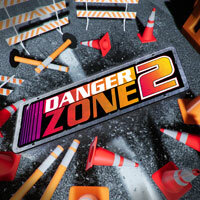 Danger Zone 2 is the second entry in the series of arcade car games developed by an independent studio Three Fields Entertainments. The studio was created by the founders of the famous Criterion Games, Alex Ward and Fiona Sperry. The gameplay in Danger Zone 2 is focused on creating spectacular crashes. The players are awarded cash for doing this. They can also share their results on online scoreboards. The developers provided eight vehicles. Among them, there is a tractor, a sedan, an exotic supercar, and a racing car. Contrary to the first entry in the series in which the action took place in a special testing zone, in Danger Zone 2 the crashes are created on American, British, and Spain highways. The players are trying to wreck the greatest havoc possible on twenty-three “black points” located in seventeen locations. Similarly to previous games developed by Three Fields Entertainment, Danger Zone 2 is powered by Unreal Engine 4. The game also uses advanced physics of three-dimensional objects. The console versions of the game are taking advantage of the capabilities of Xbox One X and PlayStation 4 Pro.